This photo was taken in a river canyon not far from where I live. As you can tell, it was a very foggy morning and the sun was just beginning to rise. My plan was to wait for the sun to make its full appearance when suddenly gunshots rang out nearby! I decided that extra "shot"' was not worth running the risk of crossing paths with some trigger happy hunters or their wayward ammo and called it a day! Despite not capturing the full rise, I do like the muted tones and misty quality in this photo. I just want to say THANK YOU to everyone who commented or fav'd my photo yesterday. It was thrilling to me to have my photo land on the PP and just to know that it was so well received. Photo editing question - There are some buoys in this shot that I find very distracting and would have liked to remove. However, I have neither the software or knowledge to do so. Currently, I just use Picasa for a bit of cropping, straightening, etc. Is there an (affordable) photo editing software that you would recommend for removing extra clutter from an image? Very pretty colors. I think it is fine without the sun in view. Wow... Beautifully composed scene. I love the tones! This is another lovely capture, Lisa....I don't know about the software - but will stay tuned here as I am needing some editing software too. No doubt its bit gloomy here but it is interesting shot. The fog has made it altogether a different view. Would love to watch same shot on clear day. For photo editing software you can use Windows live photo editor. I do that. Wonderful shot Lisa. Looks spectacular. Re the editing. Photoshop elements or paint shop pro both have the tools that you need. Alternatively check out some freeware sites anything that has a clone facility should do the job. Gorgeous colour palette. Lovely pic. beautiful shot! love the tones the fog gives! Greetings from Cambridge UK. Nice shot - atmospheric for sure. So beautiful. Love the tones, the POV and the softness. Nice photo. Have never had to abandon shooting because of gunshots! I find Windows Live Photo Gallery good for basic editing - have moved to this from Picasa as you can do a bit more with it. Sublime tones beautiful composition , subtle yet dramatic : brilliant image! Love the light coming through the fog. Fog is so much better than grey skies. Beautiful! So beautiful! The fog really makes this shot! I love the color of the sky too. @hemu You will definitely see this canyon again. I love it and know every season will present interesting photo ops. @hemu Thank you also for the recommendation for photo editing software. I will check it out. @timrox Thank you, Tim. Thank you also for the suggestions on photo editing software. I will be investigating those options. @blincodave And, greetings to you from Boise, Idaho! I love that this community allows us a window into other parts of the world. I look forward to following your photos. Thank you for the comment, Dave. @dolphin Thanks Molly! Thank you also for your recommendation. I will check out Windows. Like you, I am seeing the limitations with Picasa. Hmmmm... These cliffs look familiar! But cannot remember them snowy! So lovely! @rjanow2012 Thanks Ramona. It's amazing what a little snow and fog will do to a landscape, isn't it!? I know some 365'ers are using free photo editing software called GIMP. Our camera club is going to have a demo this Wednesday, and I was able to download it here: http://downloadhaus.com/gimp/. Personally, I use Photoshop Elements, which is reasonably priced but has no manual. I recommend buying "Photoshop Elements, The Missing Manual" if you buy the software. I love your photo. 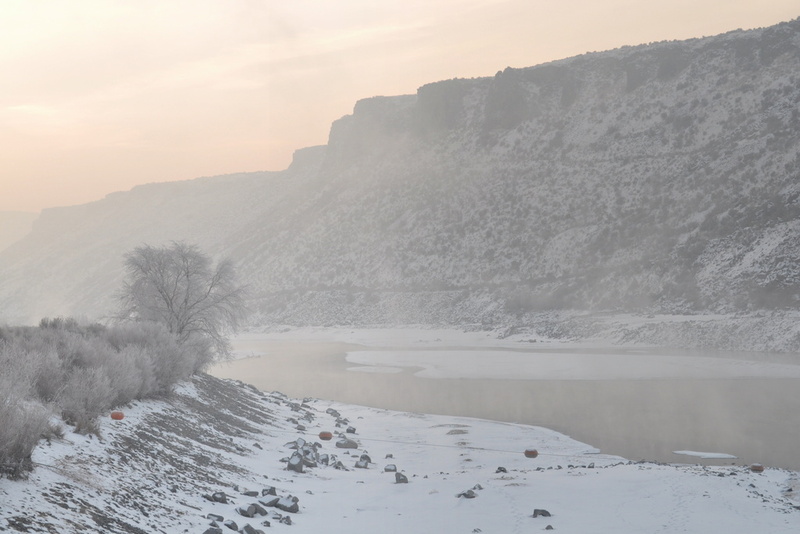 After looking at Snake River canyons lots of times, I have never seen one in fog like this. What a pretty scene. Too bad you were interrupted. Photoshop Elements is a decently priced software option that has a huge range of tools for editing. Sometimes you can even find it on sale for about $50-60. Also, regarding making the PP, someone mentioned tagging your photos with something to show they were on the popular page so you can look them up whenever you want. For example, mine will have a tag lbjpp which is my initials and "popular page". @rvwalker Hi Ross, Thank you so much for your detailed comment. I appreciate all the info about photo editing software. I will definitely explore those options. I've use Adobe Lightroom on Windows , now on my Mac I use Apple Aperture. I always shoot in RAW, apply edits to the RAW files and then export to jpg. Someone else mentioned GIMP, I've used that too but I don'y think it can edit RAW files. Lightroom definitely *can* work on RAW files and there's an OSX version for Mac users. @smalbon Stephen, thank you so much for responding to question. It's really helpful. I know I have so much to learn. I will definitely explore those options. I, too, have a Mac so will look into Aperture (and Lightroom). Thanks again! @lisjam1 Hi Lisabell, Thank you for the recommendation for Elements. I will definitely explore further. It's time to spread my photo editing wings, I feel. Thanks also for the tip on tagging the PP. I know I will never forget having a photo make it to that page, but good to tag it to the photo, too.